I was happily surprised by daffodils springing from the bulbs that rejuvenate themselves annually in my backyard. I think they've been there at least five years...I don't water them or tend to them in any way...they just surprise me every time. 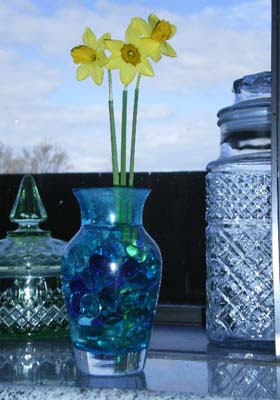 I plucked a few and placed them in this little blue vase that sits in my kitchen's bay window along with the short green candy dish of my grandmother's and the large jar of my mother's. What a nice back drop they make...there is lovely glass in my life even if it's not in a handmade bead. I haven't blogged in a while because I was nursing my son through that blasted flu...he had it for a week, fever and all. That same week just happened to have a big project for me every day, so by the weekend I was ready to relax, but still had to deliver and then pick up our income tax papers, buy a new car battery and have the tires on my recently purchased used car replaced. Luckily my husband was able to join me and make it all enjoyable rather than feeling like a chore. Yesterday I vegged and today I was able to spend time with my lovely son that isn't home much. We had lunch after shopping for a bike for him and it was just a wonderful time, chatting and swapping stories. I told him how I treasure these few moments together while he still lives at home. 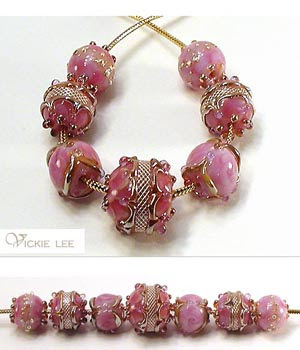 Otherwise, I have a couple of earring pairs to work on and then must get busy designing beautious spring jewelry. Until then.....ta. Have you EVER hunted for cupcake confetti????? I couldn't find what I wanted, so now I'm punching it by hand and selling it on Etsy. It's pretty much extinct...if it ever existed in the first place...other than the wimpy mylar ones from the party shop and food confetti sprinkled atop real cupcakes. I just know that some of you have been looking for it too...well, here it is! 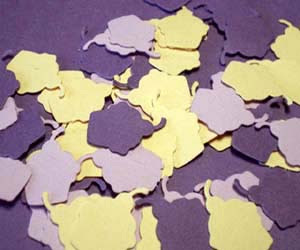 The paper confetti is cut from good, thick cardstock in your choice of 12 soft pastel colors. I selected this thickness of paper so the cut would be crisp and the confetti wouldn't crumple..even the little cherry stem is quite safe. Visit my Etsy shop for more details: http://www.etsy.com/view_listing.php?listing_id=9549560. It's fun to make the world a better place when you can. 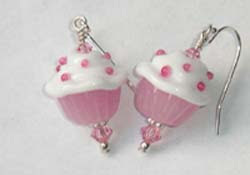 This is just a quick update on the cupcake beads above...both styles are on order as the artist is awaiting new glass that she will play with until she finds these colors. If you want to be sure to secure a pair of earrings or would like a bracelet with even more of these beads, you may do so when you pre-pay. I need to know your quantity by this Thursday, Valentine's Day. Please email your request to me at julie@rockerjewlz.com. 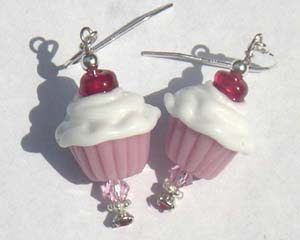 A shopper at Etsy created a treasury featuring several pieces of my jewelry...goto: http://www.etsy.com/treasury_list.php?room_id=27945. It will be interesting to see if this draws much traffic to my Etsy shop...it's fun watching the increasing statistics of the visitors. It's almost impossible to create a treasury so I'm really glad I made it into one. I hope you visit. Did you watch "Lipstick Jungle" last night? I LOVED that the fashion designer HAD to eat a cupcake when she was bummed...and to warm her heart, her man offered her one on a silver tray via his valet. Ive been seeing cupcake "stuff" popping up everywhere but knowing this t.v. show reached millions of viewers, it just seemed to cement the necessity of cupcakes in our lives. As stated in the film "Life is beautiful", "it is important to have the unnecessary". So true. I just purchased a cupcake card for my niece whose birthday is next week and I just received a cupcake paper punch in the mail today! Since I'm having such difficulty finding cupcake paper and cupcake confetti, I'm going to make colored paper cupcake confetti to put up for sale on Etsy...it'll be awesome. I'll be including a few confetti cupcakes inside all the boxes of my cupcake jewelry I mail out...not so many that they spill madly onto the floor, but just a few to maintain the theme...fun! It's funny what we hold so dear. 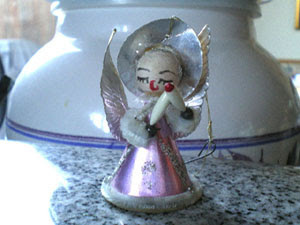 This little angel is my most prized Christmas ornament and it's funny how funky it truly is. My mom and dad gave each of us girls one in a different dress color in 1960, and the boys each got a different bird ornament. This angel is made of thin cardboard and pipe cleaners, for heaven's sake, and the silver wings and halo seem to be silver painted cardboard...to resemble tin. It's an easily crushable item and now I can't even get the pipe cleaner edges white anymore...and I just love her more than any other possession I have! There is so much emotion wrapped up in this little lady and I don't even recall receiving it or any memory that must have made it so special. On the cardboard bottom, in pencil, in my late mother's beautiful penmanship, is my name and the year...still clearly legible. It's got to be one of the oldest items I have other than my birth certificate and one very cool ceramic carousel flower vase from the baby shower given in my honor...that I should also photograph. This little angel is wrapped in tissue paper and placed in a small box each year. How can such a simple, funky object mean so much??? What possession of yours affects you this way? Valentine update: after being sick and having to pore over business papers in order to prepare for personal income tax, my heart designs have gotten away from me and now it's too late to even bother putting any up in time for Valentine's Day. Interestingly enough, the same thing happened prior to Christmas and I had more sales AFTER the holiday than before...so perhaps it will be the same after Valentine's Day! This is the first keyring I've made. It was very different as a challenge. I've never had to consider the weight of beads like this or make a piece that needs to fit in a hand, just so, for a practical use. I'm just used to making pretty jewelry! The strawberry is by Kristine Dery of Krissybeads and the red lentil with the awesome bead caps is by Jena Fulcher. This request grew out of the others before it. 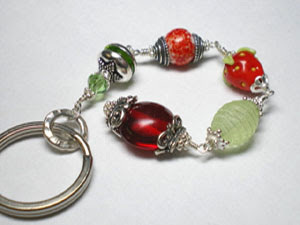 The order started as a request for a strawberry bracelet which led to a desire for strawberry pendants and then to the keyring. It was fun to have this progression blossom from just one client who had the vision of more amazing possibilities stem from the first piece.